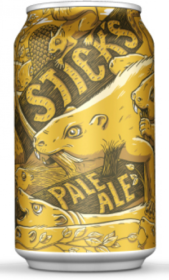 Stick’s Pale Ale is an American beer, it has an alcohol content of 5.5%. Session beer! Steve (AKA Stick) wanted to craft a beer that he can drink all day long on horseback or rafting or just sitting in the sun on a great summer day and this is it. It’s complimentary to our Insane Rush IPA with a lower ABV so you can enjoy more.